The Final Round of the 2018/2019 Cranecorp WA Modified Sedan Series will be held this Saturday Night at the Moora Speedway, located in the Central Midlands of Western Australia. Twelve Modified Sedans have entered for the seventh round with the event supported by Moora Automotive & Servicing. Nathan Penn and Matt Noakes have won three rounds each during this seasons series with the winner of the final round likely to become the 2018/2019 Cranecorp WA Modified Sedan Series Champion. Young guns Branden Fraser and Paul Stevens along with former state champion Allan Mortimer have enjoyed consistent seasons and will be looking to finish the series on a high note. Local Moora driver Dale Cockman is set to make his first start with the Modified Sedans on Saturday Night, with long time competitor Peter Fraser returning to the division after lengthy layoff from the drivers seat. Each driver will contest three ten lap heat races before the Southern Stump & Mulching Services Shootout and Twenty Lap Main Event. 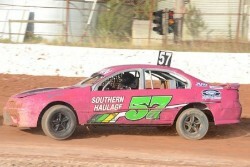 Racing from 6pm with Production Sedans, Street Stocks and Junior Sedans also on the program.